Nowadays, chatbots are popping up like dandelions with more and more companies rolling them out to increase customer convenience. According to ubisend, 21% of the customers find chatbot as the easiest way to interact with a business. Also, customers are 10 times more likely to engage with a chatbot. So, what makes these little AI-powered assistants so appealing? Answer- their versatility. Chatbots can be used to perform a wide array of functions within the realms of customer service, customer interaction along with several “top of the funnel” marketing and advertising campaigns. Moving on, with the introduction artificial intelligence, chatbots have become more sophisticated than ever. The technology behind these bots is so good that many times, it becomes hard to distinguish these chatbots chats from actual human conversations. In this article, we will have a look at some of the foremost benefits of using chatbots for your business. Let’s begin. It is no secret that customer service is the most significant factor to success. Whether you are Multinational Corporation or a small local business, having a dependable round the clock customer support panel has a huge impact on your customer satisfaction. With the help of chatbots, this customer support process can be largely improved. Chatbots can be programmed to quickly respond to repetitive questions as well as forward the request to a real representative in case a more complicated action is required. This helps in saving the time of customer service representatives by automating repetitive and monotonous tasks and enabling them to focus on more important areas. Additionally, chatbots help organizations in handling more tasks at the same time, so no customer has to wait. Mostly, all customers are interested in engaging with a brand via chat, as it is faster and easier to use. Thus, the businesses have a great opportunity to employ chatbots on major social media platforms to locate the right prospective clients. This is a more feasible option than building an entirely new app to engage with customers as it requires a huge amount of money and time. 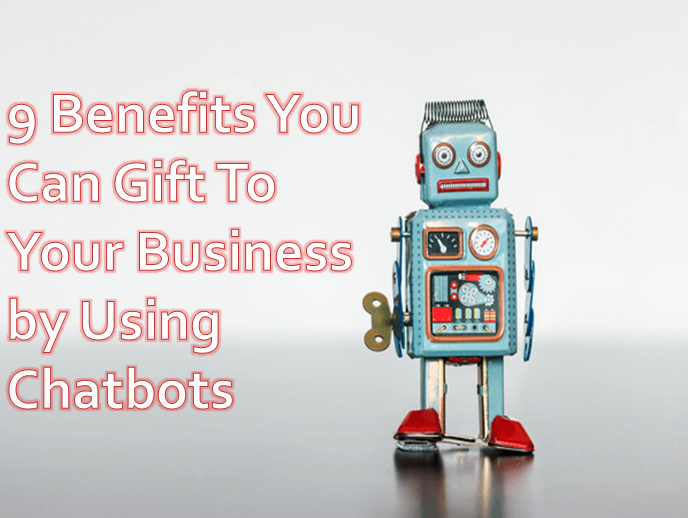 Also, reaching out customers through chatbots platforms like Facebook Messenger or Kik helps businesses in involving more consumers than through emails or newsletters. Chatbots are amazing tools to interact with the customers. They gather valuable customer feedback by asking simple questions that can be used for making significant improvements in your products and services. Also, the information gathered can be used for optimizing your website by fine-tuning the low converting pages. For instance, if you know that your landing page generates a high amount of traffic but doesn’t convert very well, you can use a chatbots to reach out to your visitors with a survey to understand the reason why they are abandoning the page without purchasing. Additionally, chatbots can be largely instrumental in studying consumer behaviour, purchasing patterns and trends. A company can decode previous conversations with the customers to identify their preferences and further suggest them new products accordingly. As discussed above, chatbots gather all relevant and useful information about a customer. This information can be used to develop personalized messages that guide the customer through his buyer’s journey, making sure that every step leads to higher conversion rates. This is an important tactic that can help you to effectively rev up your marketing strategy. But, it is important to ensure that you do not get annoying with these personalized messages. Also, it is wise to do some A/B testing on your customized messages to determine which copy works best. One major cost that impedes businesses from growing is the cost of employing and training more people to handle and support customer interaction features. With chatbots, there is no such hassle. A human can typically only interact with one customer at a time, but chatbots can handle any number of customer requests simultaneously, without any delay. They can quickly adapt as your business grows. A recent study deduced that companies who engage with their customers via social media platforms were able to increase the customer spend by up to 40%. Of course social media is a great platform to interact with users. But, having a chatbots on these platforms can further improve engagement rates by conducting interactive conversations. In case of a typical customer service interface, the information offered to the users is generally more explicit. But a chatbots only furnishes to-the-point information at a time. This helps in making the conversation more interactive by keeping the users interested for longer. Repetitive tasks often make people become weary of them. They get bored and start looking for variety and rotation. As a result, the business has a demoralized workforce. This in turn makes them prone to errors and also has a negative effect on their productivity. On the contrary, chatbots excel at handling repetitive tasks. They are capable of automating monotonous jobs without making any compromises with the quality or customer experience. Also, since they are machines, they are less likely to make any errors. Nowadays, customers are majorly looking for special and tailor-made experiences. With the advent of AI-powered chatbots, businesses are able to gather significant customer information and in turn, deliver highly personalized experiences. This helps in acquiring better customer engagement and higher customer acquisition rates. Employing a fully-functional chatbot is much cheaper and faster as compared to creating a full workforce, hiring employees for every task. Chatbots are a one-time investment that can easily scale as the business grows. By using chatbots instead of human workforce, you will not only save on employee costs but also avoid complications caused due to human errors. In addition, the customers can easily and quickly start an interaction with the chatbots. This helps in improving user acquisition rates at minimal costs. The above discussion points out that chatbots are a great alternative to employees for performing repetitive and relatively simple tasks with optimal precision. These bots extend a cost-effective solution for automating one of the prime aspects of every business- customer satisfaction. Also because of the rapid popularity of chatting platforms, the application and benefits of chatbots continue to rise. It is anticipated that chatbots will dominate how companies interact with their customers in the near future. Consequently, it is best to hire the services of a reputed chatbot development company to capitalize on this upcoming trend and keep an edge over the competitors. However, the only challenge of using these chatbots is developing the right “personality” or conversation capability of your bot in order to increase as well as retain your brand perception.